Yahoo application id why do you need it? Since i have made a detailed video tutorial, how to submit your blog to yahoo, and before that process, you need to generate wordpress sitemap.xml file first. While generating the sitemap with wordpress sitemap plugin, you need to know your Yahoo application id to notify yahoo about your blog’s updates. Notifying other Search Engines are not difficult and complicated, however with Yahoo, we have to apply ourselves for a Yahoo application id. 1. Submit sitemap.xml to Google. 2. Submit blog to Yahoo. 3. Get your blog indexed by Bing. 4. Submit your blog to Ask.com. About how to get Yahoo application id, actually it is a self explanatory step, but i have notice some people are confused where to get it and how they can actually choose the options, especially on the browser-based application or generic options. So we will get the Yahoo application id in this post, and if you want to know how i did create sitemap for this blog, you can watch it in my wordpress create sitemap.xml post. 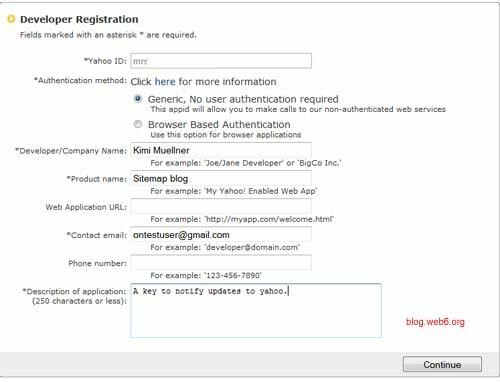 Yahoo application id is not only for sitemap. Because i am using wp robot for my autoblog, this id is really useful for wp robot settings, because it also needs to have Yahoo application id. You can actually use different Yahoo application id for each project you have by registering your project and get the new id. Also, when you do not need the key anymore, you can trash it by deleting your project name in Yahoo developer account, which we will not talk about it today. Although this step is important, you may be want to know the other options that i did configure with this blog’s sitemap, especially the priority options for pages, posts, categories, etc. Feel free to see my wordpress create sitemap.xml video tutorial and post. 1. In the process creating wordpress sitemap.xml, you will see there is a text, saying “ Notify YAHOO about updates of your Blog”. The options of getting yahoo application id steps. – Yahoo id: Usually your yahoo id from your yahoo email address. It is filled in automatically, once you are logged in to your yahoo email account. – Authentication method: Generic. No user authentication required. This appid will allow you to make calls to our non-authenticated web services. – Developer/Company Name: Type your name. – Product Name: Type something, i typed, sitemap blog in this demo. – Contact Email: Your email address. – Description of Application: Describe your application. 4. You will then see your Yahoo application id page. 5. Copy and paste to your sitemap.xml option in your dashboard. 6. Click “Finished” button once you are done. That’s it, we now know how to get Yahoo application id for your sitemap xml plugin option or wprobot if you use it. Hi Kimi, thanks for visiting and commenting on my blog. I do use XML sitemaps on my blog but as yet i haven’t set it up with Yahoo, Ask or Bing. Now that i have found your blog and the great posts detailing how to do so I will get it done. As you know my mum is currently in hospital meaning my time is taken up so I’ll add this post to my list of things to be done. At the moment i’m just catching up with those people that have left comments on my blog and returning the gesture, but i have made a note and will follow it through. So sorry to hear your mum is in the hospital, oh i know how it feels. I hope she gets well anytime soon! Submitting sitemap.xml helped SE to index the included posts or pages faster, also in webmaster tool, we can examine which posts are indexed or not..
Me again Kimi, on quick reflection I thought this was to important to leave for a later date so have followed your instructions and have now completed the task. Future Readers should be able to compare the times of my last comment and this one and will see that by following your detailed instructions this task only takes a few minutes to complete. Thank you Kimi, I’ll now watch out for the results. Thanks for the valuable thought!